A bit of a sad story goes along with this project. For a while I was romantically involved with a younger woman and to my mind things were going along well. It seems that she didn't feel the same way and, as an unambiguous signal, she moved out. Oh, sorry about that. Back to woodworking, I had been in the process of building her a nice painted maple chest and had even been teaching myself tole painting to decorate it. I had gotten as far a preparing all of the stock except for the bottom when she departed. That stock sat in the corner of the shop for what seems like an eternity until I realized that "When life gives you lemons, make lemonade" could also to apply to "When life gives you a kick, drink wine" (or something like that). I finally figured out that it might just be possible to squeeze a small wine rack out of the stock without losing much. I determined that making it double-sided and putting it on casters it would be more useful in a crowded area. Looking at the picture, the sides were made from the front and back of the chest. The top and bottom panels were to have been the ends of the chest. The dividers ripped from the lid and various bits of what was to have been the chest's base were used here and there. There are nine of the vertical bars: front, center, and rear. The major components were held together using Kreg screws, some used as intended, and some used as normal screws. The casters came from Amazon and are 4-inch 275-pound rated. 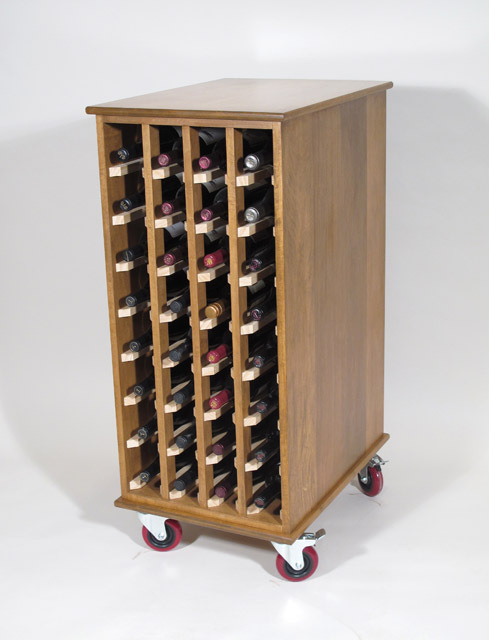 This is more than enough to stand up to five cases (actually 64 bottles) of wine quite easily and still roll well over small obstacles. The original use of the wood called for it to be painted so no care had been taken to match the wood closely so I tried to cover the glaring problems by applying stain. Finish is water-based poly. If I recall correctly, I think that I had applied a wash coat of shellac to the pine strips before applying them but at this remove I wouldn't swear to that. Overall size of the rack is 18½X25X42½. All I can say is that it works well and the stock is no longer in the shop annoying me.